Petenwell, a Pier, tall Pines...plus a sensational cabin - what could be better! 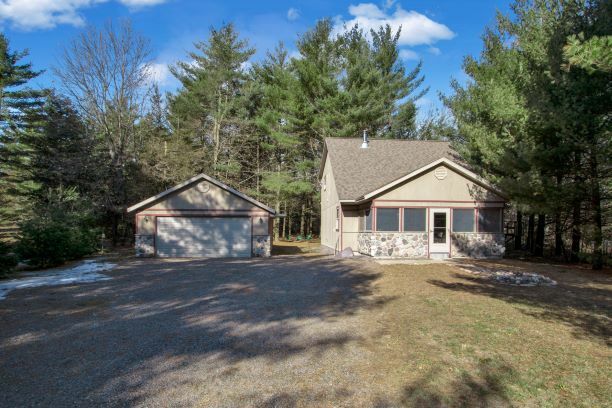 On a quiet cul-de-sac, this enchanting saltbox-esque bungalow sits just one lot off the shore and a stone's throw away from your private pier (half ownership) on gorgeous Lake Petenwell! Finely crafted, the north woods ambience is front and center with beautiful pine car siding throughout the entire home. The living/kitchen area has a "lofty" ceiling, while a floor to ceiling field stone backdrop highlights the wood stove and breakfast bar. A log railing upstairs overlooks the kitchen's generous cabinetry and rustic stone tile back splash. Other features include three nice-sized bedrooms; a wonderful loft family room, with side deck; airy front porch, and a fire pit. Add to that a deep two car garage (22X28, a pontoon will fit, they tell me), a spacious wooded yard, and a zip line just for fun! Beds and bunks included, and all furniture is negotiable. Sit by the fire, enjoy boating on one of Wisconsin's largest lakes, and play Championship Golf VERY nearby! Location: Across the cul-de-sac, Outlot 1.